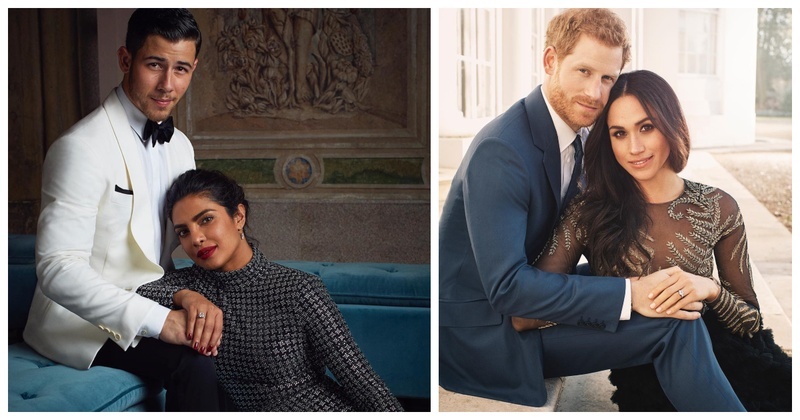 Priyanka Chopra and Nick Jonas Recreate Prince Harry And Meghan Markle's Royal Engagement Picture & How! Yes yes, don’t you second guess yourself. The much-in-love couple seems to be replicating the Duchess of Sussex and Prince Harry’s official engagement picture. Well well, Meghan and Priyanka are BFFs so this comes as no surprise and here’s hoping it would make a great inside joke for the besties. While Priyanka was seen wearing a long-sleeve, floor-length, figure hugging gown, Nick chose to wear a white tuxedo looking his usual dapper self. For all the couples looking to coordinate their look for their wedding, but don’t wanna be too matchy-matchy, take cues from this duo right here. “Our lives were kind of taking us in different places... People thought we were being coy, and so did we until we cut to now (and) we’re engaged. The story sort of wrote itself. It was kind of immediate, and I think we just knew it was right and jumped right in. And we’re very happy. On their famous #Nickyanka hashtag, Nick added, “She likes Prick. I don’t like that one that much”. If you wanna know what did the firang think of the all-desi Roka ceremony, here’s what he said, “After we got engaged, we went to India, to her home country, to Mumbai, and my parents came along. We did this beautiful Roka ceremony. It’s a confirmation from both sides of the family that they approve of the engagement. I hear wedding bells loud and clear!